Many disadvantaged parents recognise education as the promise of a better future for their children, but struggle to send them to good schools as they are too expensive. In fact, 80% of Indian children go to state run schools where the often poor quality of education they receive leaves them with little hope of competing with better privileged students later in life for jobs, college education or even in completing their school education. There is, therefore, an urgent need to improve the resources at hand for these children and mentor them to build their skills and self-esteem. Bhumi's volunteers work amongst orphaned and underprivileged children in Tamil Nadu, Karnataka, Maharashtra, Rajasthan, New Delhi and other parts of the country with the aim of providing children with quality supplementary education that will enable them to become responsible and productive citizens of the future. Our educational programme includes teaching English, Computer Literacy, Mathematics, Science, developing extra-curricular talents and individual mentoring. Since 2006, Bhumi has consistently been improving the learning abilities of disadvantaged children through education as well as building their self esteem, confidence and leadership; qualities that will prepare them for future employment and help them break the cycle of poverty. 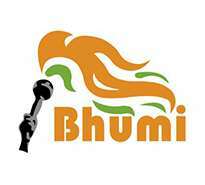 The efforts of Bhumi's volunteer force, consisting of over 1,000 students and young professionals under the age of 30, benefits over 12,000 children every year. By making a small donation of Rs. 500, you can help Bhumi provide a better and more secure future for a disadvantaged child.